All show tunes and orchestral pop. Robeson’s vocals are nothing short of great. Yet the rather generic orchestral backing does a disservice to the music. It’s worth noting that on this version of “Ol’ Man River” Robeson has changed (and improved) the lyrics. Possibly Robeson’s best album. There are few singers with a voice as capable of commanding of attention as Paul Robeson’s. His deep, resonant bass-baritone is so iconic that the man’s portrait should probably appear in dictionaries next to the word “dignity”. The recording of “John Henry” included here is one of Robeson’s very finest. The Legend of John Henry is an old neo-Luddite folk tale, based on a real historical person (or amalgam of many real persons) working to build a railroad line, probably as convict labor after the Civil War, about a poignantly suicidal triumph of labor over the technology that owners of capital wield to destroy the means of workers’ support and dignity. John Henry defeats a spike-driving machine in a one-on-one competition, only to die of exertion. Lawrence Brown‘s somber piano provides deftly understated accompaniment. Brown plays in response to what Robeson sings, in the black tradition of call-and-response. The way Robeson sings is amazing. He uses controlled vibrato, just as any trained opera or bel canto pop singer would. His enunciation is impeccable. Every word is booming yet unmistakable. But he sings the song with non-standard diction. This places him halfway between vernacular music (true folk “spirituals”) and the ordained and accepted music of society’s ruling classes (“hymns” in the religious context). Spirituals came after Robeson’s political radicalization, and it is easy to look back at it and see how his approach to performance injects the vernacular into dominant forms as a kind of bottom-up revolutionary act, as performed by a black man in Jim Crow America who sings so well and with such unmistakable facility for bel canto pop music that he cannot be dismissed as an untalented ruffian making a bunch of mere noise. Michael Denning‘s book Noise Uprising chronicled the revolution from below made possible from 1925-30 by the advent of electrical recording technology — before the Great Depression collapsed the global market for such records. Paul Robeson represents a different sort of revolutionary stance, though not necessarily an entirely different one. 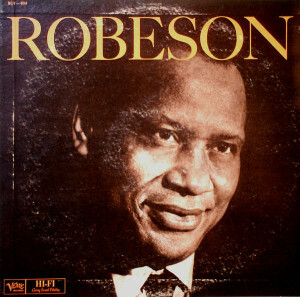 Robeson took advantage of electrical microphone technology to capture his voice in ways never before possible (his record label recorded him with the very latest technology). He also balanced the expectations of the powerful with the interests of the downtrodden. And he did so very, very well. His use of vernacular elements was more limited though, focused on more precise, subtle mobilizations in his vocals. Take “Balm in Gilead,” which slurs the words “there is” to sound a bit like “dere is” in a line otherwise enunciated with stately exactitude. These effects let you know which side Robeson is really on. He can sing in accordance with all the rules the powerful insist upon, but he carefully deviates from them, to inform the audience that he is choosing to do so, for purposes that are manifestly not dictated by the powerful. On “Nobody Knows de Trouble I’ve Seen” Robeson sings the last line “glo_ry, Hallelu__jah” with an abrupt shift in his intonation of the last syllable of the word “Hallelujah” to express a kind of release and hopeful promise that stands in contrast to the somber weariness of the rest of the song. Lawrence Brown sings accompaniment too. On “Joshua Fit the Battle of Jericho” he adds responses to Robeson’s leads. Brown’s higher pitched voice, and quicker, less noticeable vibrato are counterpoints to Robeson’s booming voice. The tempo is much faster than most of the songs on the album too. It is followed by another duet song, “By an’ By.” Brown’s lines are phrased in a heavier vernacular, though one that comes across as slightly studied and academic — in other words, staged and inauthentic. This places Robeson is a kind of hero role, making his voice sound more commanding and impressive. The albums wraps up with three tour de force solo vocals: “Sometimes I Feel Like a Motherless Child,” “John Henry” and “Water Boy.” The last two songs are part of Robeson’s standard repertory. He performed those songs in most concerts and recorded them multiple times. “Water Boy” uses melisma to the maximum. Robeson’s use of vibrato is also a thing to behold. He carefully controls the vibrato over long, sustained notes to match the rhythm of his vocal phrasing. Much like “John Henry,” “Water Boy” is a kind of hero tale, framed as (presumably) an adult boasting to a “water boy” of his strength and capabilities as a worker. It is at once a celebration of labor and a vehicle perfectly suited for a black man in the Jim Crow era to demonstrate prowess as a singer. If all this makes Robeson seem too much of an activist, when all he was doing was singing, then it is worth considering what happened to him in the following decades. His passport was illegally denied and he was blacklisted. His son also alleges that the CIA surreptitiously conducted “mind depatterning” on him as part of Project MK-Ultra (probably with LSD). The powerful knew that Robeson and his music were indeed a threat to white supremacy and other forms of oppression. It is a bit difficult to walk away from hearing a Robeson recording like Spirituals without some degree of respect, if not awe. 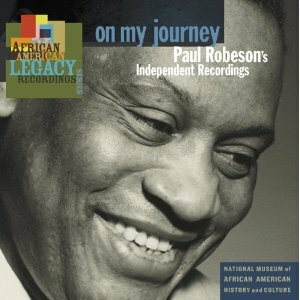 An excellent collection of early Robeson recordings for His Master’s Voice. There are a large and confusing number of Robeson compilations available. This one focuses exclusively on recordings from the 1920s and 1930s (and then mostly from the 30s). The bulk of this consists of showtunes/pop, but there are some spirituals as well. 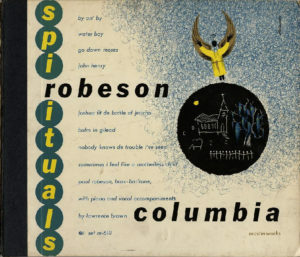 Though these recordings are so old as to have nowhere near the fidelity of Robeson’s 1940s recordings for Columbia Records, they, along with associated stage and screen appearances, are what helped first make him famous. The songs included here are well selected. It’s important to note that at this early stage Robeson was forced to record racist, condescending material in order to make a living in Jim Crow America. So the version of “Ol’ Man River” from the musical “Show Boat” that is so closely associated with Robeson opens with the lyrics “Niggers all work on the Mississippi / Niggers all work while the white folks play.” It is crucial that these bigoted lyrics not be excised from history and forgotten, as if it all never happened, but remembered for what burdens an artist like Robeson had to deal with. Yet, this compilation does a huge service by sequencing “Ol’ Man River” (possibly the reason some might pick up this album) as the last song. It’s worth noting that in later years when Robeson’s stature was assured, he changed the words of “Ol’ Man River” to be more dignified when he performed and recorded it. These were recordings made in the 1950s when Robeson was blacklisted during the cold war McCarthy witch hunt era. He started his own label Othello Records and offered recordings on a subscription basis by way of the newspaper Freedom that he contributed to during that time. His longtime arranger, accompanist and collaborator Lawrence Brown had largely stopped working with Robeson following a 1949 concert in Peekskill, NY in which an angry mob of idiots attacked the stage (to which Robeson responded in later concerts by surrounding himself on stage with unionists as bodyguards/bouncers, like his own Red Guards). Instead, pianist Alan Booth is present on most of these recordings. Booth was a competent pianist, but he didn’t have the deep connection that Brown had with Robeson. To complicate matters, any musicians that worked with Robeson during this time risked having their union card revoked (so much for unions supporting the working man), and even studios that gave Robeson recording time faced FBI harassment. Under those circumstances, the mere existence of these recordings is impressive. 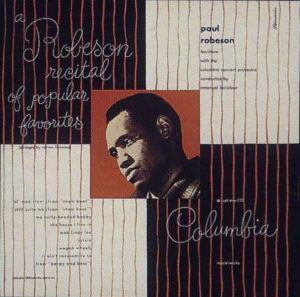 Yet, overall, they aren’t quite as good as Robeson’s earlier Columbia recordings. There are still very fine performances here, like the stunning and resolute “Bear the Burden in the Heat of the Day” and “On Mah Journey Now, Mount Zion.” There are fairly extensive and interesting liner notes with this release though, and a few tracks were previously unreleased. Paul Robeson had his passport revoked by the U.S. State Dept. in the 1950s. This was illegal, as courts later found. On top of that, President Truman signed an executive order that prevented him from traveling to Canada. Normally American citizens could travel to Canada without a passport (* this long-standing practice was ended during the so-called “war on terror” in the 2000s). The grounds for all this was that Robeson was supposed to be some kind of a threat during wartime. “Wartime” you ask? Supposedly, the Korean War. But there was no declaration of war with respect to Korea, so it wasn’t a “war” as far as the U.S. Government is concerned, so the actions against Robeson were illegal — not to mention completely spurious. When prevented from traveling to a scheduled concert in Canada, Robeson set up on in a park on U.S. soil, standing feet from the border, and sang for a broadcast across the border. That was 1952. He came back again three more times for similar cross-border concerts. Recordings were made and released by the International Union of Mine, Mill and Smelter Workers. This comp — released in honor of the 100th anniversary of Robeson’s birth — collects the 1952 and 1953 performances. The one from ’52 is by far the best of the two. Though what’s interesting is that not all of the ’52 concert seems to be present here, as I Came to Sing (recorded at that concert) included “Water Boy” which is omitted here. You can’t find an American better than Paul Robeson. There are a lot of things life can throw at a person. You would have to say that Robeson encountered a good many of them and, in the face of those challenges, made the right choices no matter the burden of doing so (at least in his public life). Best known for his definitive performance of “Ol’ Man River” from the musical Show Boat, Robeson’s staggering list of lifetime achievements included being an all-American athlete, attorney, star of stage, screen and recordings, and internationally recognized civil rights activist. He took a principled stand in favor of the USSR, and as a result was harassed and persecuted over a period of decades by the U.S. government (the same government that tacitly permitted lynchings into the 1960s [with President Truman refusing Robeson’s challenge to formally ban lynchings by law] and to this day has a national holiday honoring the genocidal plunderer Christopher Columbus, the last man to discover the “new world”). 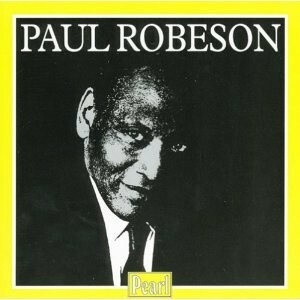 Robeson (Verve) was recorded August 22, 1960 in London. It was during a time when Roberson’s health was starting to deteriorate. His passport was revoked and he was denied international travel from 1950-58. But after the U.S. State Department reinstated his passport — and then only when forced to by the U.S. Supreme Court after the case Kent v. Dulles, 357 U.S. 116 (1958), a decision written by Robeson’s law school classmate William O. Douglas — Robeson resumed travel and revived his international performing career. That allowed him to make these recordings abroad. For his age, and given his health problems, his bass-baritone voice was still commanding. Though it had lowered somewhat, the vibrato a little shakier at times. While he sometimes performed “spirituals” (an early term for afro-american gospel music), this album features non-religious “pop” repertoire with orchestral backing. 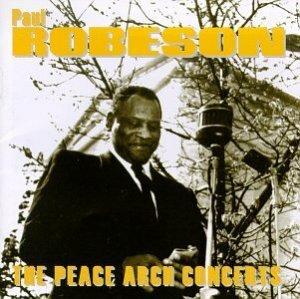 It was a return to pop for Robeson, who focused more on folk and activist material in the 1950s. Here, his voice is out front and the theatrically-leaning orchestral backing tastefully restrained. If ever a musical discussion turns to the question of the merits of lighter fare, turn to Robeson for proof that a great singer can turn any material into something meaningful and lasting. Not only that, if in the final analysis the history of the 20th Century mostly bore out Hannah Arendt‘s dictum about “the banality of evil,” then Paul Robeson’s provides us with a crucial look at what it will take in the 21st Century to find the antidote.